So first things first, we have to clear a little business out of the way. Regular readers of this column will recall a certain Heisman trophy winner being dragged through the mud for basically being of apparent poor character. Well now, Johnny Football doesn’t come across too bad now, does he?! It takes a big man to say sorry, and, Johnny Football, I am sorry. You are definitely not the least reputable character amongst that Heisman class. 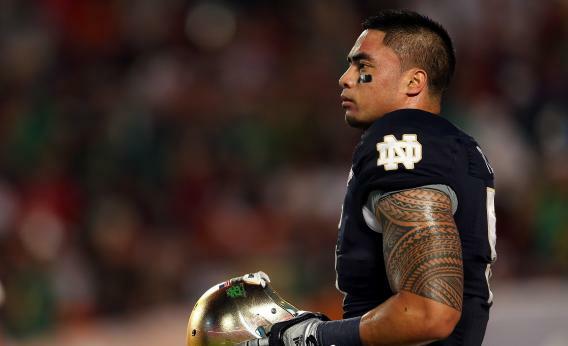 No, that dubious title now belongs firmly to Notre Dame’s Manti Te’o. Last night the Internet almost exploded under the weight of the Manti Te’o story. You could literally hear it creaking. The story is that this past season many of us (basically almost all of us) believed fully that Notre Dame’s dominant linebacker Manti Te’o played out his magnificent personal season with the heavy weight of the death of both his grandmother and his girlfriend hanging over him. Some few people were aware there were cracks in the story around his supposed girlfriend, Lennay Kekua, the majority of us found out the depth and severity of those cracks last night. There is no such actual human being as Lennay Kekua. Incredibly, it would appear either Manti Te’o or a team of crack hoax organisers that Te’o and his father Brian Te’o are blaming for the controversy were able to create a human being that Manti Te’o dated and grieved over, and that the entire main stream sports reporting media of the United States bought hook line and sinker. It would appear that it is not just Donald Trump that struggles to obtain facts, like believable birth certificates, in Hawaii. Whatever about the facts of the matter, which are still few and far between and often confused, there are enormous, gaping holes in the logic behind Teo’s story that he is victim of a hoax. The crazed race to find the real ‘facts’ behind all this is like a side story from the movie The Usual Suspects, you half expect the name Kaizer Soze to pop up somewhere beside the name Lennay Kekua. You almost need to cut everything else out and look at the issues around much of what Manti has said in the last 24 hours but most of all in the past couple of years, to fully understand the insanity behind all of this. Say we take it that Manti is telling the truth, and he is just a poor young student athlete caught up in an elaborate hoax, well even then, there are gigantic gaps in the logic behind his supposed story. Consider the below for yourself. Obviously the main factor is that Manti and his father in particular have at very best lied in the past about actually physically meeting this alleged girlfriend. At best, Manti is a complete and utter idiot. At worst? Manti and possibly his father are an integral part of the hoax. Let’s have a look through the problems in Manti’s alibi. Manti, we are sorry for your loss. A few questions for you, however. Notre Dame's athletic director Jack Swarbrick said you had learned of the hoax in early December. If that's the case then why are the public learning about it in late January? Is there a particular reason for this, other than a desperate attempt to play out the season without this controversy arising? Manti, Mr Swarbick has outlined how you told him that when you were at the ESPN awards on December 6th you received a phone call from a woman whose phone number matched Lennay Kekua's. He is widely quoted as saying "When he answered it, it was a person whose voice sounded like the same voice he had talked to, who told him that she was, in fact, not dead." Manti, our question is, why did you wait until December 26th to inform your coaches of the hoax? Why did you wait three weeks to reveal the alleged hoax? Something that is really troubling us today Manti, it was reported by Sports Illustrated’s Pete Thamel that you would phone your sick girlfriend in her hospital room and you would dutifully stay on the line with her for hours on end as she slept through the night. A quote from the interview "Her relatives told him that at her lowest points, as she fought to emerge from a coma, her breathing rate would increase at the sound of his voice," Well Manti, what relatives? Where are they? Also, what hoax organiser has the time to pretend to be in a hospital bed and stay on phone with anyone, even the great Manti Te’o all night? We have all played a few pranks in our time, I may have called a friend’s house once pretending to be the Police but after 3 minutes myself and my buddies were on the floor laughing. Hours and hours of sitting on the phone with someone as they slept? Phone hoax’s just don’t last that long. So, are you lying, or embellishing the facts perhaps? Or did that call ever take place? ESPN senior columnist Gene Wojciechowski is on record as saying he couldn't find an obituary for your supposed lady friend Lennay Kekua. He also couldn't find any records about a car accident. These should have been obvious red flags, and because of this Mr Wojciechowski asked if he could contact Lennay's family. Why did you say they would prefer not to be contacted? Why did you tell Wojciechowski the Lennay family didn’t want any further pictures of Lennay circulated also? Manti, if this was all a hoax, who on earth are you talking about? What family members? Who, exactly? If this is a hoax, why were the pretend girlfriends pretend family contacting you to tell you to tell the press to back off? Manti, the South Bend Tribune (story now removed) said you and your girlfriend supposedly locked eyes after the Notre Dame and Stanford game in 2009. The same paper later wrote that your father, Brian, said Kekua sometimes travelled to Hawaii to see you, though the family had never met her. I assume you know what we’re going to ask next Manti, basically, which is it, are you lying about having locked eyes with this supposed girlfriend, to make your college football career sound cooler, or is there something deeper and darker going on? Manti, back to that South Bend Tribune article, in it you were quoted as saying that you and your girlfriend met November 28th 2009 after Stanford's 45-38 victory over Notre Dame in Palo Alto, according to the South Bend Tribune: "Their stares got pleasantly tangled, then Manti Te'o extended his hand to the stranger with a warm smile and soulful eyes." Further to this you told the paper that Kekua, allegedly a Stanford student, physically gave you her phone number. Hey, you know what’s coming, right? If this is all a hoax, then how did all this physical interaction happen? You need to either explain that, or admit that you lied your backside off to the media. Manti, your Dad Brian told the Tribune in 2012 that "Every once in a while, she (alleged girlfriend) would travel to Hawaii, and that happened to be the time Manti was home, so he would meet with her there." Manti why would your Dad lie about this? Or did you lie to him about it? Which is it? Finally, and we’re kind of angry about this one, after your hoax, virtual, alleged girlfriend died, you came out with this heart wrenching quote; "All she wanted was some white roses. So I sent her roses and sent her two picks along with that." – Manti, and we really want a straight, honest answer from you on this one, Manti, where did those flowers go? Where did you send them? To what physical address? You know what, you feel like you need a shower after considering all of the above. What are we being left with, currently? Is this all a hoax created by friends of Manti's , as some kind of cruel joke? Was Lance Armstrong involved (to divert attention from him!)? Did an Alabama alumni foresee that Notre Dame would provide the final hurdle to the BCS and create this heinous hoax? Possibly one of the few shreds left to Manti is that there is another way of looking at this. This is Manti te'o's private life. No crime (at least none we are aware of as yet) has been committed by Manti. Other than the curiosity of the public, Manti owes nobody an apology on any legal grounds. The big problem of course is if this is a hoax, and if he is a victim, well then Manti has told a whole mess of lies. First, Manti Te’o has to get in front of this and either a) explain why he said he physically met his ‘girlfriend’ on several occasions (if she was a hoax) or b) come clean and spill the entire beans on this ridiculous story. There is another group that has some explaining to. The journalists who merrily reported on Kekua graduating from Stanford, the journalists who reported on Manti meeting with his ‘girlfriend’ on those occasions, the journalists who reported on her ‘death’, they have a lot of explaining to do. Have the upper levels of journalism really experienced that level a drop in journalists standards, analysis and fact checking, that a website like Deadspin is the authority on this completely insane story? The final possibility is that President Obama created this hoax in his spare time between planning to take away all the guns that honest hard working Americans have been hoarding and further plans to change the state flag of Texas to that of Mexico. Of course, we have no way of knowing if that is true or not. It could be. It might not be. We're just asking questions. Questions the journalists who had access to Manti all season long should have asked. We love your comments! The communicative back-and-forth is one of the best parts of sports journalism. A couple of quick notes on same. This is a sports blog, and it deals with both the USA and Ireland, hopefully that answers a few questions! Also, your opinion is greatly valued, strong ones even more so, but if you revert to personal attacks or any kind of hate speech, your comment will be deleted. Repeat offenders will have their IP address banned.Thanks for all the great feedback to date!